New Year’s Day is traditionally known as a big day for hangovers from folks having too much to drink but the Nashville Predators got an early start this year. If you look at the history of the franchise, many times after big emotional wins over arch rival Detroit, the Predators have gone flat for a game or two. This time the beneficiaries have been Edmonton on Sunday and Colorado on Monday when they defeated the Predators 5-1 at the Pepsi Center. The Predators fell behind 2-0 on back to back goals by Cody McLeod and were down and out of the game 4-0 before Jason Arnott scored the Pred's lone goal halfway through the second period. The final Av's goal by John Michael Lyles at the start of the third was merely a little more icing on the cake for a game that had long since been decided. For the second night in a row, a combination of marginal defensive play in the Predators zone, less than average goaltending and a couple of bad bounces led to a lopsided defeat. Pekka Rinne allowed 5 goals on 21 shots in a game where the Preds actually out shot the Avs 26-21. However, many of the Predators shots were shots “in name only” and not true scoring chances. At least two, if not three of the Avs goals were ones that Rinne would have stopped on an average night. My favorite statistic, the “misery index” (goals scored per game) dropped to 1.44 goals per game as for the last 9 games as they have scored 13 goals during that stretch, six of which came in two games. With the holiday no movement period over, it is very likely that the Predators will return Antti Philstrom to Milwaukee and bring up Ryan Jones who has 17 points in the 17 games he has played on the AHL level. He is the most likely addition from within the organization to add a little punch to the anemic scoring that the Preds have had of late. The video highlight of the game that will be shown numerous times on highlight shows for years to come occurred during the second period when Jordan Tootoo lined up Cody McLeod near the board in front of the Avalance bench and missed. Since he didn’t hit his intended target he flew over the boards and landed in the floor of the Colorado bench. As he returned to the ice he drew a double minor from Darcy Tucker who retaliated for Tootoo’s antics. The Predators return home for a New Years Night match with the Vancouver Canucks. They play their next five games on home ice where they have played much better so far this year (10-4-1 at home vs. 7-12-2 on the road including 5 straight road losses). The schedule is much more home friendly in January and February so it’s time for the Predators to make their move. Throw a blanket over them… Putting a winning streak together will be critical for the Predators at this time to keep their playoff hopes alive. Monday’s loss dropped the Preds into a tie for ninth with 37 points. The entire lower half of the Western Conference is tightly bunched with only four points separating seventh (39 points) and fourteenth (35 points) so the Preds really need a strong home stand to move out of the current log jam. Missing man returns… After sitting out 10 games, Ville Koistinen returned to action in place of Kevin Klein who drew the ire of Coach Barry Trotz with a couple of pointless turnovers the night before in the Preds loss to the Oilers. Ville was -1 in 18:51 minutes of play, getting two shots on goal and picking up a holding penalty for the Preds first penalty of the game at the end of the first period. Picard wins again for Canada in World Juniors… Pred prospect Chet Picard started his second straight game in goal for Team Canada at the world Juniors stopping 12 of 13 shots against Germany in Canada’s 5-1 win on Monday night. It is unclear if Picard will start on New Years Eve in Canada’s final preliminary round game against the USA squad which should be a game for first place in the pool. The USA squad which includes Pred prospects Jonathon Blum and Colin Wilson plays the hapless Kazakhstan team on Tuesday. Predator fans should mark their calendar for the 6:30 Wednesday USA-Canada match up which will be carried on the NHL Network, XM 204, and at several sites on the internet. It should be a good opportunity to see three future Predators playing on the world stage. Forty-eight hours and several thousand miles away from riding high in an emotional big win game against the Detroit Red Wings on Friday, the Nashville Predators simply didn’t have enough gas left in the tank to compete with the Edmonton Oilers. They lost 5-2 and really never competed after the first period ended in a 2-2 tie. Dan Ellis started in goal in spite of being emotionally drained from the Friday night win and being weakened by illness. He was chased midway through the second period after giving up two quick goals to Eric Cole and Andrew Cogliano. 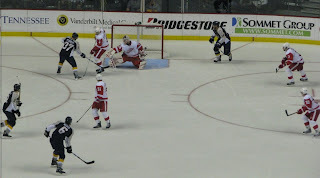 He was replaced by Pekka Rinne who gave up a quick goal to Sam Gagner but was solid the remainder of the game. Other than Pekka Rinne playing outstanding for a period and a half stopping 15 of 16 shots many from point blank range there were few highlights for the Preds. Marty Erat, who may be trying to break out of his scoring slump, and Shea Weber were the goal scorers for Nashville in the first period. For the rest of the game the Preds returned to their “misery index” (goals scored per game) scoring drought of the last few weeks. I really can’t understand why Barry Trotz went with Dan Ellis in goal when he had Pekka Rinne who was well rested and had played well against the Oilers when they last met in October. Throw in the fact that Ellis played well against tomorrow’s opponent, the Avalanche in November, and it even makes less sense. The Predators return to action on Monday night in Colorado where they take on the Avalanche and then return home after this short two game incredibly long (mileage-wise) trip. Hopefully, Barry Trotz will put Pekka Rinne back in goal and give this team a fair shot at breaking even on the trip. Young Preds at the World Juniors Through three days of the World Junior tournament the four Predator Juniors that are competing have played as well as their pre-tournament billing. Goalie Chet Pickard starting his first game for Canada shut out Kazakhstan in a 15-0 route. Pickard only faced 11 shots and was never really tested… US Captain Jonathon Blum has played solid defense and picked up assists in both USA wins so far. He was +3 in the opening game on Friday. Alternate USA captain Colin Wilson scored the games opening goal on Friday and added two assists. Wilson also assisted on the first goal in the US win on Sunday…. The least heralded Pred prospect in the tournament, Jani Lajunen of Finland, scored the Fins first goal in Sunday’s game against the Russians before the Fins succumbed to the more talented Soviet team… Predator fans should mark their calendar for the New Years Eve match up of young Pred stars when the USA plays Canada at 6:30 PM. The game is available on the NHL Network, XM Radio, and various sites on the internet. In an absolutely thrilling game, the Preds defeat the Detroit Red Wings 3-2. This was definitely the loudest crowd we've had this season.This was a big improvement from the past few games. The first goal came 9:29 into the first. Greg Zanon shot the puck right off the face, off from the point, blowing right past Ty Conklin. With 5:56 left, the Predator defense had a huge brain fart. They let Dan Cleary come in from the point right up the Dan Ellis' door step and put one "where Mama hides the cookies". We left this period tied at one. At 13:24 into the period, with six seconds left on the power play, Rich Peverley passed right to Kevin Klein, who was right in the slot, and he just drilled it past Conklin for a 2-1 lead. With a little under two minutes left in the second, Erat made a nice feed from the Detroit trapezoid to Vern Fiddler right in front of Conklin, who just nailed one high for, what ended up being, the game winning goal. Coming out of the second period, the Preds led 3-1. In this third period, the Predators really started throwing their weight around. 3:00 into the third period, Andreas Lilja faked a shot from the point and passed it to Mikael Samuelsson who slapped one, oddly enough, through Dan Ellis' five-hole. How does someone score on your five whole at a 90 degree angle? 3-2 ended up being the final score. Dan Ellis has faced six 35 plus shot games in 11 starts against the Red Wings (credits to Jay Levin for that stat.) He played a tremendous game last night, shutting down Pavel Datsyuk on the breakaway attempt, and a lot of other quality chances. We went one for three on our power play last night. We were generating prime scoring chances, rather than passing the puck around and getting one or two decent chances (if that!) We were perfect on the penalty kill against the number two ranked power play team. First Catfish of the year! 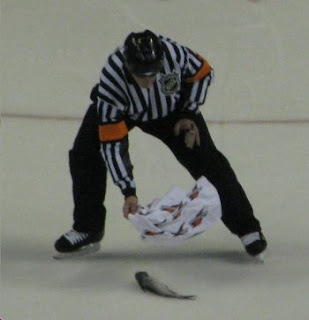 The traditional catfish was thrown after the first goal tonight. That's something they haven't done at all this season. It's good to see that out there again. The Predators next game is in Edmonton on Sunday. The Predators Scoring Slump Continues. First of all before we get into the article, PredsOnTheGlass would like to wish you all a Merry Christmas! Now to the article. The Predators have only scored two goals in the past three games. Though we may have beaten the Islanders 1-0, we can't always rely on our goalies. Also, it's the Islanders, not that big of a feat. We need to pick up one or maybe even two decent scorers before the trade deadline. Who to drop though? Obviously, I would be fine with Greg DeVries leaving. I don't know if Nashville is ready to let go of a first round pick, but it might be a possibility in the future if we are in bad enough shape. Nashville has never really had any "scoring machines". The closest to a "scoring machine" we've seen has been injured that past year and a half, and now it's time for some change. Coming into this season, I was saying that the biggest thing that we needed to work on needed to be our power play. As of today, December 24th, the Predators are ranked 29th in the league on the power play. I thought it was bad last year, but they have gotten worse. If we could start scoring consistently on the power play, this problem would be done with. Come on Trotz! I would really like to see some action taken or a big improvement, soon. My father received a call from local newspaper on Tuesday wanting us to write three articles a week about the Predators starting in 2009. We're pretty excited about that! Excommunicated goaltender Tomas Vokoun helped keep the lid on the Nashville Predator’s offense by shutting down the Predators in a 3-0 shutout win in Sunrise, Florida Tuesday night. Vokoun, the Preds all time shutout leader, made Nashville the 30th and last NHL team that he has chalked up a win against during his career. The Predators “Misery Index” (otherwise known as average goals scored) dropped to 1.17 in the last six games. During that stretch the Preds have only scored 7 goals, 3 of which came in a shutout win against Dallas on December 13. The Predators are 2-3-1 as the scoring drought seems to be hardening. The Predators played their usual brand of tough, hard skating hockey but Florida simply was the better team on this night blistering the Predators with 43 shots. The Predator defense was not having the major breakdowns that were prominent early in the year but left Florida with far too many scoring chances. The offense garnished 27 shots but few were quality chances. The game winner for the Cats came at 13:12 in the second period when Pekka Rinne lost his stick and was out of position leaving Michael Frolik with an open goal off a pass from Michael Boyton. The Predators were never out of the contest and you really got the feeling that they would eventually find the net to tie the game. That house of cards tumbled on a Cory Stillman slapshot at 15:28 in the third. The fat lady was still crooning when Michael Frolik kicked sand in the Pred’s faces with an empty netter with 14 seconds left in the contest. Pekka Rinne’s continued stellar play was the only highlight for the Predators. He stopped 40 of 42 Panther shots of which almost half were quality scoring chances. In spite of the loss it was one of his better outings of the year as he was peppered from all angles from opening face-off until he was pulled for an extra skater at the end. While the demotion of Marty Erat to what is being called the “third line” paid dividends last Saturday, it was a total failure on Tuesday. Erat, Fiddler and Peverly were each –2 on the night while only getting off four shots. Barry Trotz needs to rethink his line strategies with a focus on putting players together that have a chance to score goals. On paper, other than the first line of Arnott, Dumont and Ward which is producing no offense, the current line configurations all look like marginal third or fourth line combos. The alleged second line of Legwand, Tootoo, and Philstrom has no more punch than the Erat, Peverly, Fiddler third unit. It would really be a miracle if you could squeeze a goal out of the Smithson, Bonk, Belak fourth line. The bottom line is that the Predators are short one consistent 30 goal scorer. If they are waiting for the return of Steve Sullivan, they will be out of the playoff picture before that happens. The rumored trade of DeVris, Rinne and Radulov (rights) to Calvary for Matthew Lombardi and James Vandermeer is laughable. The rumor monger that came up with that needs to get off the sauce. It’s time for the tandem of David Poile and Barry Trotz to step up and pull the rabbit out of the hat as they have done annually the last several years. Detroit visits Music City on Friday and if Dan Ellis does not recreate the magic that he had in last year’s playoffs against the Wings and the Preds offense remains anemic, the Pred faithful will be headed for an early exit from the Sommet Center. As we wind down for a couple of days, PredsOnTheGlass would like to wish each of you a Merry Christmas and many blessings as we head toward the new year. And for the Predators, may they find a new player or two under the tree on Christmas morning. The Nashville Predators and the New York Islanders both entered Saturday Nights game in a slump. Both finished the game still mired in the same slump, the difference being the Predators had two more points as they continue their pursuit of a Western Conference playoff position. The Preds have only scored more than one goal once in the last five games but have five points to show for it. The Islanders have lost nine straight and managed only a point during that span. Both goaltenders were sharp but Pekka Rinne was the star of the night stopping all 23 Islander shots for his third shutout in December and improving his record to 7-1 for the season. As well as the Predator defense played it was amazing that he was able to stay sharp as the defense did not allow many scoring opportunities all night. Joey MacDonald was also deserving of a W for the Isles but was a victim of a bad combination of a hot defense shutting down their limited offense. Vern Fiddler was the Predators only scorer for the second game in a row. Playing on the third line with Rich Peverly and the demoted Mart Erat, his goal came early at 6:48 in the first. The Preds top line of Arnott, Dumont and Ward was snake-bit on nine shots as was Shea Weber who launched 5 bombs with nothing to show for it. The Predators return to the ice Tuesday at Florida before taking Christmas Eve off and then regrouping for a tough three games in four nights stretch which includes Detroit at home and a blistering road trip to Edmonton and Colorado. Assuming Trotz continues to reward shutouts, it should be Pekka Rinne in goal on Tuesday and then Dan Ellis against the Wings to see if he can recreate last year’s playoff magic. Hopefully the Preds offense will give him more than a goal to work with against the Wings. Eastern Conference Watch… I said before the season that the difference maker in the last few playoff positions in the West would be the records against the Eastern Conference. The Preds finished the night in 8th place buoyed by their 5-1-1 record vs the East where they have picked up 11 of their 35 points so far. Arnott Makes 1000 … The Predators celebrated Jason Arnott’s 1000th NHL game on Saturday with a video salute right before Vern Fiddler’s goal. At Friday’s practice, Arnott’s hunting buddy Ryan Sutter had taken up a collection from team mates and purchased a 4 wheel drive golf cart looking ATV for Arnott’s hunting trips (that Suter always attends). It sounds like to me that Suter wanted one and used the occasion to get everyone else to help pay for it. I guess that sounds like a much better story for the wife too. The Nashville Predators lost to the Phoenix Coyotes 2-1 in front of a sparse gathering in Glendale Thursday night. The Predators, who have only scored 21 goals in their last 12 games, played solid defense, received adequate goaltending from Dan Ellis, and stayed out of the penalty box but still could not overcome Rookie Kyle Turris’s two goal evening. In spite of out-shooting the Coyotes 31-27 the Predators still couldn’t find the back of the net. The Predators played their style of game in what has been their style over the last few years - good speed, tough defense, fighting for the corners and quality goaltending but on this night as on too many others it did not produce a win. Earlier in the year when the Predators were producing goals at a lot higher clip, defensive bread-downs due to defensemen being out of position and not staying home to take care of business, losses were coming in higher scoring, sloppy contests. Now the Preds are getting beat not because of poor play but because of a complete lack of offensive production. I was amazed before the game at how similar the season stats for the Preds and Coyotes actually were. In every category there was only a very small difference between the two squads. Nothing changed from that during the game other than the Preds going from one point up in the standings to one point down. It was a very tight contest of very similar teams from start to finish. As we enter the “no movement period” during the holidays, GM David Poile needs to take a hard look at the same issue that has existed since prior to the departure of Alexander Radulov during the summer. The Predators are still one or two quality point producers short of being able to go beyond a finish in the six to ten range in the conference. The early season experiment with youngsters did not work. The team is blessed with many prospects and loaded with draft picks for next summer. We simply cannot play that many youngsters all at the same time and we are in desperate need of more offence. That is the perfect recipe to get on the phone and cut the best deal you can. We simply can’t wait until the trade deadline to make a move. We need help now! Empty House in the Desert… The main thing I noticed about Phoenix was the complete lack of a crowd. From the TV angles showing most of the arena it was one of the smallest crowds I’ve ever seen at an NHL game. For as much as is said about Nashville’s attendance problems, we have never had that sparse of a crowd. After the game when I read that there were over 14,000 there I was amazed. The Preds need to figure out how to count all their empty seats. We would have a sellout every night. Preds Attendance Woes.. Speaking of attendance, the Predators announced their paid attendance figures through 12 games and they are woefully short of the 14,000 paid required for revenue sharing from the league. The average paid stood at 12,810 compared to 12, 738 for the first 12 games last year when they averaged 13,429 by season’s end. With the economy in a tailspin nationwide, I would not be surprised if the league stepped in and lowered the requirement to last year’s 13,250 figure in order to provide somewhat of a “bailout” for teams that fall short of this year’s higher figure. Sully Update… Steve Sullivan is now practicing with the team on a somewhat limited basis and as the only Predator in the team’s history to average over a point a game for the Preds, would be a welcome addition to the team. I still feel that this is the longest of shots and that it would be a mistake for anyone to put all their eggs in his basket as a solution to the team’s recent scoring drought. To no one’s surprise, Predator prospect Chet Picard was named as one of two goaltenders on Team Canada’s roster for the upcoming World Junior Championship that begins on Boxing Day and will be held on Canada’s home soil in Ottawa. He is the odds on favorite to be named the starting goalkeeper as the camp continues. Canada’s first game will be against the Czechs on the tournament’s opening day. The 19 year old 6’1” 216 pounder from Winnipeg, MB was the first goalie drafted in last summers NHL draft at 18th and has been having a stellar season this year in his fourth season playing for the Tri City Americans of the WHL. Last season he was named WHL and CHL Goaltender of the year when he amassed 46 wins becoming the 6th WHL goaltender ever to surpass the 45 win mark. In 2006-07 he was the Americans backup goalie to current Montreal Habs young star Carey Price. Picard has been a product of team Canada’s developmental program attending Hockey Canada’s Program of Excellence for Goalies the last two summers. Picard joins other Predator youngsters Jonathon Blum and Colin Wilson in the tournament as they represent the USA squad. The Nashville Predators recovered from the bad case of chronic fatigue syndrome that they experienced Thursday in Columbus to shut out the Dallas Stars 3-0 Saturday night at the Sommet Center. The Predators can thank the Detroit Red Wings for wearing out the Stars physically and emotionally in their game in Dallas on Friday night in which the Stars won behind Marty Turco’s best game of the year. Dallas appeared much like the Predators did on Thursday when they just didn’t seem to have a lot of jump in their game. While the Predators did play solid team hockey, this was not a game that would be described by the marketing slogan “Predator’s Hockey: It Stays With You”. For a shutout that was 1-0 game for 43 minutes it was not a crowd-pleasing edge of your seat type game. The crowd of 15,500 was unusually quiet for the entirety of the outing. Unlike most of the Predators recent games there were no controversial plays or fights. The closest thing to discord was a little pushing and shoving after the horn at the end of the first period. The game’s first score came early at the 4:27 mark of the first period when Joel Ward deked Dallas Goalie Tobias Stephan completely out of the blue ice to put the puck into an empty net. Playing on the first line, Ward played his best game in his short NHL career as his initial goal ended up being the game winner. He also got the empty netter on a little flip off of the back of his stick with 86 seconds left in the match. David Legwand picked up the game’s second goal when he made an aggressive move to shove it under Stephan’s pads at 7:05 in the third. Dan Ellis was solid in goal for the second game in a row picking up the shut out. In the post game interview he was quick to give credit to the whole team for playing a much-improved defense than we saw at times earlier in the season. Ellis stopped all 27 shots that Dallas threw at him. Dallas was a post away from tying the game at the mid point of the second and Ellis stood tall on several other scoring chances. The shutout was truly a team effort as the Preds blocked 16 shots and were really swarming the neutral zone and working Dallas away from the slot all night. For Dallas, goalie Tobias Stephan deserved much better than the scoreboard showed. He made several amazing stops including one memorable highlight film quality glove save on a rebound while he was laying flat on his back. He stopped 35 of 37 Predator shots and did not have the defensive support from the team that was deserving of his good effort. The Predators are off until Thursday when in another weird scheduling quirk they have a very long out and back one game road trip to the desert where they take on the Phoenix Coyotes. Hopefully, a few days off before then will revitalize their recent anemic offensive attack. Thank You Marty Turco! During the pregame warm-ups as we sat by the glass taking pictures, Marty Turco was posing and teasing my daughter Laura which thrilled her to death. Before leaving the ice Turco went to the photographers hole in the glass and gave a puck to Laura that she will treasure for a long time. For all the Sean Averys in the NHL (one to be exact) there are 689 other players that are happy to be at the rink playing the game. We give a big PredsOnTheGlass salute to Marty Turco for being the good guy of the game. 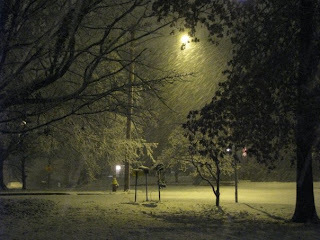 While we sat in the middle of a freak December snowstorm in Columbia, Tennessee, the Predators suffered through their fifth game in eight days losing to Columbus 3-1 in a shootout. For the fourth time in nine games, the Preds entered the third period in a scoreless tie. It was an absolute miracle and only through the strong effort in goal by Dan Ellis that they even got a point out of the game. The week started for me riding high in the saddle thinking that the Predators had four games this week in which they had good chances for wins. I was figuring in my head that if we could get between six and eight points that we would have a solid lock on fourth in the Western Conference. By 9:00 Thursday night the Preds were still mired in eighth place with only one more point to show for our efforts in the last three games and fourth place is still four points away. I was correct in my original higher math prognostication but the Predators were too tired to follow through on their end of the bargain. Back to reality now. Despite my high expectations after last weeks run, the Predators are really starting to look fairly average again. There is not another coach in the league that gets more bang for the buck with what he has than Barry Trotz. The team gives every ounce of effort they have every night. Unfortunately, the team is currently at a point were they are physically, mentally and emotionally out of gas. The Preds were so tired that there wasn't even a fight which may be a first for a game with the division rival Blue Jackets. The Preds have good reason for being tired as they have played the second most games in the league and 17 road games which also second in the league. Fortunately, after the game against the Stars on Saturday, they have four days off and only play two games each of the next two weeks. The negative side of that is that there will be few points available to help maintain their eight place position. Other than Dan Ellis’s strong play in goal for the first 65 minutes of play, there were few real highlights for the Predators. Ellis stopped 35 of 36 for the game but allowed two of three in the shootout dropping his shootout record to 1-3 for the year. He has only stopped 5 of 11 shots in shootouts this year. Pekka Rinne was perfect in his one shootout match. Trotz has indicated repeatedly that he will never change goalies for a shootout regardless of the success or record of either. Marty Erat broke his goal scoring drought with the Preds only score halfway through the third period. His eight goal was his first in 13 games since November 6th. The Predators best opportunity prior to Erat’s goal was on a 5 on 3 in the second period but they only were able to get off a single shot. The Predators were solid again in the face off circle winning 63% of the 54 draws they had. Individually, Radek Bonk continued his good face off season going 10-2 in the circle. Ryan Jones was the winner of the injury recall sweepstakes as the Predators were forced to go to Milwaukee to replace the ailing Jordan Tootoo and Scotty Nichol. Jones was fairly solid in his return to the Preds after having a very good run for the Admirals where he had 6 goals, 4 assists and a +4 rating in 8 games since being sent down three weeks ago. Last night Jones played 13 shifts logging 10:43 in ice time and copped a 2 minute minor for diving which I’m sure was frowned upon by Barry Trotz. I would imagine that once Tootoo and Nichol return, Jones will see some more AHL action. The Predators return to action Saturday night to face the circus formally known as the Dallas Stars at the Sommet Center. This is the last game of Sean Avery’s suspension so they will be without their number one clown. Hopefully, the Predators will get plenty of rest today and play with a little more energy at home and pick up the points they so badly need. Against the Stars, I would imagine that Dan Ellis will start in goal coming off his strong outing last night. As has been the case for the last three years (Vokoun-Mason, Mason-Ellis, and now Ellis- Rinne) the team really seems to play better as a unit in front of the backup goalie. I for one would like to see Pekka Rinne play at least half, if not more, of the games for the next few weeks to really get a look at who will be the best goalie as we wait for the David Poile – Barry Trotz due to pull another rabbit out of their hat to get the Predators into the playoffs. Steve Sullivan Update – I about drove off the road yesterday when I heard on the radio that Steve Sullivan was close to being able to practice with the team. As much as I like Sully, I still maintain that he will never play another NHL game. If he is finally able to skate well enough to practice, he needs to thank the Lord for his improved health and retire before he really does more permanent damage to his surgical back. At this point, no one would begrudge his retirement and then David Poile could quit dreaming about Sully’s return and try to round up the additional scoring forward that the Predators so desperately need. I wonder if Alexander Radulov is ready to come play with the big boys again. Nashville Predators Coach Barry Trotz announced that the league had reviewed the video from Tuesdays game against Vancouver and that no action would be taken against Alex Burrows for the gravity defying high armed hit to J P Dumont that set off one of three brawls in the game. Trotz appeared ready to move on but did comment that the questionable plays would be discussed prior to the Predators next meeting against Vancouver on New Years Day in Nashville. He indicated that the team would be focused on playing a "hard, gritty game, and a win". However he added "but if given the opportunity to lay a big, legal hit on someone, I don't think anyone will back down." Tonight's Game... The Predators return to the ice tonight in Columbus against the rival Blue Jackets. While J P Dumont did not suffer any major injuries from the hit on him Tuesday, Scotty Nichol appears to be out for up to a week and will miss tonights game. Jordan Tootoo is also out and did not make the trip due to a lower body injury sustained Monday against the Blues. It is hopefule that he will return on Saturday against the Stars. Trotz indicated that the Predators would recall one of four forwards from Milwaukee from a list that includes Ryan Jones, Patric Hornqvist, Jed Ortmeyer and Mike Santorelli. He was waiting until after the Admirals game against Quad City which they won 5-3 to make a decision. In the Admirals win, Mike Santorelli extended his point streak to ten games and Jed Ortmeyer scored the game winning goal. Ryan Jones also added an empty netter to continue his strong play at the AHL level. Regardless of who Trotz recalls it will be a whole different world taking on the Blue Jackets who are always out for blood against the Preds than playing in the AHL. In a contest that featured three questionable hits by the Canucks and more bad blood than a Hatfield-McCoy feud, the Vancouver defeated the Nashville Predators 3-1. The game featured a total of 70 penalty minutes between the two teams. The biggest problem was inconsistency in the officiating. There were a few real ticky-tac calls and several other instances on major infractions where there we no calls. I am not one to complain about officiating because I feel that it will even out over the course of a season, but the Predators have been on the short end of the stick far too many times this season. Many calls are being made against the Predators by reputation instead of reality. Had Jordan Tootoo been the aggressor in any of the three calls discussed below, there would have been ejections and suspensions. The Canucks appeared to have a free pass on the hits that are routinely considered dirty. The game was real chippy right from the start. The first penalty of the game at 4:14 went against Vancouver’s Rob Davidson for hooking and it wasn’t even close to being an infraction. At that point, my thoughts were in the other direction that the officials weren’t going to let them play. At the 15:06 mark in the first with the game tied 1-1, all hell started breaking loose as can be seen it he above clip. Rob Davison hit Scotty Nichol near the Vancouver bench and a brawl ensued. Of the three questionable hits, this was the cleanest even though Scotty Nichol was forced to leave the game. Kevin Klein immediately took up for his teammate and Rich Peverly, who has never had an NHL fight went after Jason Jaffray. In the second period things deteriorated rapidly at 5:19 when Alex Burrows left his feet and fore armed J P Dumont in a vicious open ice hit to the head. Jason Arnott took on a new personality and pounded on the cowardly Burrows who had dropped to a fetal position in order to avoid having to fight back. Check out the following video to form your own opinion. The whole altercation resulted in a seven minute power play for the Canucks and no penalty against Burrows who clearly should be suspended by the league. 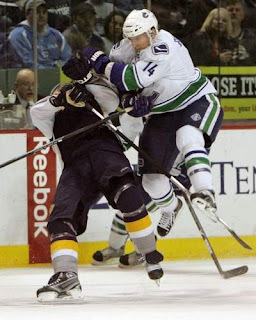 The third major infraction occurred later in the second period at 17:24 when Ryan Kessler viciously boarded Shea Weber. This play could be the “poster child” of plays that the league is trying to eliminate near the boards and included a secondary shove of the head into the glass as icing on the cake. Kessler received a five minute boarding call while Weber received a double roughing for taking up for himself. After the game, Preds coach Barry Trotz was as animated as I have ever seen on the league needing to take action against Burrows and Kessler. He was especially proud of Jason Arnott for taking action against Burrows when the officials did nothing. Trotz said on Arnott’s actions “He thought one of his teammates was hit in a dirty fashion and we’re going to stick up for each other. I don’t mind guys sticking together. It was a good response by Arnott. I couldn’t believe we ended up with a seven-minute penalty, but I don’t have any issues with Arnott sticking up for Dumont at all." Trotz further stated "The league will handle it. I'm trying to protect my players. There's two things that's unwritten. Don't go after the head, and you don't go after the knees. I think in the hockey code, I think they crossed the line a few times." Jason Arnott was equally adamant stating "I knew he left his feet. You see it on the replay, and he lands after he hits J.P. It's a blatant call, and there's two guys out there. I don't know how they didn't see that. Then the guy [Kesler] runs Webby [Shea Weber] from behind. He didn't need to hit Webby like that, from behind, run his head into the glass," Arnott said. Vancouver coach Alain Vigneault saw things from a 180 degree different point of view stating "The only thing I found special with calls in the game we were not allowed to hit them. Every time we threw a good strong clean hit, there was a scrum after. It is part of the game. It was a physical game. They took offense to some of the hits we threw." 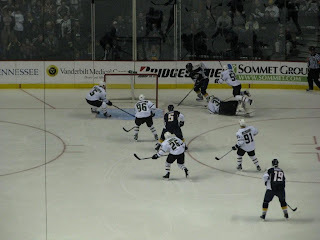 As far as the hockey action in the game itself, Highlights for the Predators included the seven minute penalty kill that had no stoppage in play for the full penalty and Radek Bonk’s goal in the first period ending his personal scoring drought. Dan Ellis’s return to goal after a four game absence was also positive as he stopped numerous scoring chances and 25 of 27 shots, receiving second star of the game honors. The seven minute penalty kill appeared to be a turning point in the game as the meager crowd really rallied behind the team once it was over cheering with ever clear rising to a crescendo of a standing ovation once it was successfully completed. Unfortunately, the subsequent Weber and Philstrom penalties at the end of the second period continued to wear down the team and resulted in the game winning goal at :24 in the third on the carryover penalty on Philstrom. The “hockey gods” as Barry Trotz talks of often did not pay back Alex Burrows as he got the empty netter at 19:16 which was the final nail in the coffin for the Predators. Bottom line, this game is a prime example of whether Colin Campbell and the league is going to be serious about putting an end to hits to the head, boarding and players leaving their feet. If they are too busy dealing with bad boy Sean Avery’s potty mouth to try to actually curb illegal hits that cause injury then they need to eliminate the instigation penalty and let the player police themselves. In typical “what goes up must come down fashion” the recent six game rocket ship that the Nashville Predators were riding ended in a massive crash in the last four minutes of their game with the St Louis Blues last night. It seems to be the way of the NHL Western conference where nine points separates third and last that on any given night any team can reign supreme. The Predators and Blues were tied with less than four minutes left in the contest. The Blues scored two quick goals 45 seconds apart and the Preds were subsequently slam dunked with an empty netter in the waning seconds of the game. The game was a spirited tussle and the Predators seemed to be the better team on the ice until a hat trick of penalties got them in trouble late in the second period. Leading, 2-1 with seven minutes left in the second period the Preds were whistled with back to back penalties to Jordan Tootoo and Vern Fidler. Shortly thereafter, Dan Hamhuis was called for high sticking on a controversial exchange with Keith Tkachuk which could have gone either way. With a delayed call the Blues scored quickly with a six on three advantage. They followed with another goal to go ahead 86 seconds later. Once the Predators returned to even strength, they responded quickly with a goal by J P Dumont to even the game at 3-3 but it was down hill from there. In the third period the Preds were out shot 7-1. Pekka Rinne made several excellent saves to keep it close during the Preds offensive palsy but finally gave in to the Blues fourth period pressure. Barry Trotz was clearly frustrated with the collapse feeling that they should have salvaged at least a point when they were tied with four minutes left. 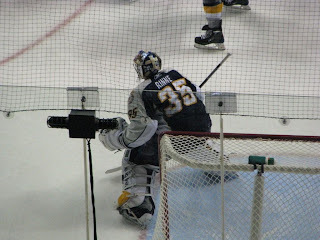 The loss was the first for Goalie Pekka Rinne who had been named the NHL’s first star of the week for the prior week. His shutout streak reached 122.57 before B J Crombeem scored the first of his three goals on the evening. Lost in the post collapse shuffle was Antti Philstrom’s first NHL goal that came on a power play halfway into the first period. The Predators have no time to mope as they return to action tonight in Nashville at the Sommet Center against the Vancouver Canucks. They will face a Canucks team that is without star netminder Roberto Luongo who continues to recover from a groin injury. It is anticipated that Dan Ellis will return in net as he was able to serve as the Preds backup Monday night. The Predators returned emergency call up Drew McIntyre to Milwaukee earlier in the day. I anticipate a much better effort in front to the home crowd on what is destined to be a rainy night in Nashville. On the strength of shutouts against Buffalo and Minnesota with a 3-2 victory over Colorado in between, Pekka Rinne was named the NHL first star of the week. Rinne sported a .976 save percentage in route to a 3-0 record for the week which brings his record to a perfect 6-0 on the season. Rinne is expected to start in tonight's game in St Louis in an effort to extend his shutout streak beyond the five periods where it currently stands. 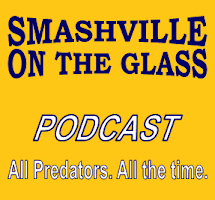 In light of the first star honor, PredsOnTheGlass is pleased to be able to to present an interview conducted with Pekka Rinne during the preseason by good friend and noted hockey writer Neil Bristow. Special thanks to Neil for allowing us to publish the interview in it's entirety. Neil Bristow -You made your NHL debut Dec.15th 2005.Can you share with us a little of what that was like? What was going through your mind at that time? Pekka Rinne - It was something that I had always been dreaming of. 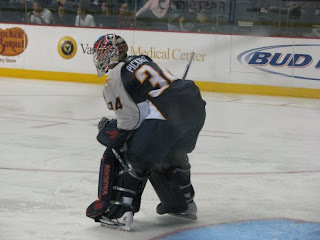 At that time both Tomas Vokoun and Chris Mason were hurt and I got the call. Everything happened pretty fast and I didn`t have time to stress about the game, we won the game and it was just amazing experience I`ll remember for rest of my life. Neil Bristow -You played with Karpat Oulu (FNL)before coming over to North America. Is playing goalie over here different than in Finland? If so, why? And did you have to make adjustments to your game at all? Pekka Rinne - The game is little different in Finland mostly because of the bigger ice surface..Players have more time to use their skills. In North America game is more north-south style of play. That`s why I had to change my game more aggressive to challenge the shooter and cut down the angles. I really like the North American style of game. Neil Bristow - What are some of your goals this year coming in to Camp in Nashville? Pekka Rinne - My goal is to have a good summer and strong training camp and make the team. Also prove that I can play in NHL and that I belong there. Neil Bristow -What is your biggest moment so far in your career and why? Pekka Rinne - When I played in Finland we won two championships in a row 2004 and 2005. It was pretty special cause I played for my hometown team in front of my family and friends. Other great moment was when we made it to Calder Cup finals with Milwaukee on 2006. We had a great team but unfortunately we came short and Hershey won the Cup. Neil Bristow - With players like Jaromir Jagr going over to play in the Kontinental league in Russia for the same money they would make in the NHL, the Russian league has stated in the past, that they will pay NHL-like salaries for players in their league. Do you see this becoming a realistic problem for the NHL, losing great European talent to Russia? Pekka Rinne - Maybe in the future, but I don`t think it`s a problem right now. NHL is such a respected league around the world that every kid in Europe wants to play in NHL someday. Neil Bristow -Who did you look up to growing up, goaltender -wise? Pekka Rinne - My cousin used to play goalie growing up and he had a big influence on me. He is the biggest reason why I started to play goalie. In NHL I used watch Patrick Roy and John Vanbiesbrouck play when growing up. in on you in a shootout? And why? Pekka Rinne -I haven`t been involved in single one shootout in NHL, but in AHL I think Darren Haydar is a player that I don`t like to face too many times. I played with him in Milwaukee ´06-07 and you would think that I know his moves, but he`s just so smart and skilled player that he reads goalies and forces them to make the first move. Neil Bristow - The NHL is once again starting the season over in Europe this year with the Lightning and Rangers battling in Prague and the Sens and Pens in Stockholm. What are your thoughts on NHL teams starting a long season over there with all the travel and scheduling? Are you in favour of that? Pekka Rinne - As a European and knowing European hockey fans I think it`s great thing that they are able to see and watch their favorite players and teams. Also it`s a good way to showcase the whole NHL and it`s unbelieveble players. And also for players I think it`s nice to see some new countries and cities. Obviously the schedule is hard but there`s more gain than harm, teams playing in Europe. Neil Bristow - What NHL city that you haven’t visited yet are you most looking forward to playing in? And why? Pekka Rinne - Beside Nashville I haven`t visited too many NHL cities, but I really like all Canadian NHL cities because hockey is just so big in Canada. I have to say it`s a privilege to play for Nashville organization we have such a great fans and hockey is getting bigger in South. altering goaltender’s equipment. What are your thoughts and ideas on that topic? Pekka Rinne - It`s a topic that everybody has different opinion. I think that if people decide to change the size of the nets, would be a mistake. All the records and games played before would lose their meaning and new era of hockey would begin. But I`m fine with altering goalie gear as long as it`s safe for goalies. Neil Bristow - Have you had any embarrassing on- ice moments in your career so far? If so, could you share a story with our readers? Pekka Rinne - There`s couple moments that I try to forget.. This one happened when playing in Finland. We played against Ilves Tampere and were leading 3-2, there was only 3 seconds left in the game and I started almost celebrating when somebody just threw the puck to net and it went in off my skate and at the same time buzzer went off. We ended up losing the game in overtime. It was the final game of the regular season and we would have finished first if we would have won that game. I wasn`t happy tell you that much. Luckily we were able to win the Finnish Championship that year so I could laugh about it with the guys afterwards. Neil Bristow - If you had the power to make changes in the NHL game, would you change anything? If so what would you change? Pekka Rinne - I think NHL have done a great job with some changes in the game last few years. It has made the game faster and more interesting for the fans and also for the players. I don`t have any new suggestions, I just try to work on things that I can control. Thanks!! I would like to say thanks to Pekka for giving me his time and also to Benji at http://www.puckagencyllc.com/. I also encourage our readers to check out the puck agency’s blog which can be found at http://puckagency.blogspot.com/ I look forward to bringing the readers at PredsOnTheGlass more great hockey content in the future.